From Washington DC - Follow US Route 50 East to Salisbury, Maryland. From Salisbury drive south one hour on US Route 13 to Onley, Virginia. Turn right at Burger King on Route 179 (Market St. in town), travel one mile. We are on the left side of the street. Traveling from the south on Interstate 95 - Exit at Emporia, Virginia onto US Route 58 east. Follow to Interstate 64 East to Virginia Beach, Virginia, and on to Route 13. Drive north one hour on US Route 13, across the Chesapeake Bay Bridge Tunnel, on to Onley, Virginia. Turn left at Burger King on Route 179 and travel approx. one mile to Colonial Manor Inn Bed & Breakfast on the left (Get Mapquest Directions). 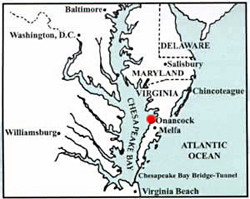 From Chesapeake Bay by boat to Onancock Creek - Set the final leg of your GPS trip for FL G #1 at the mouth of Onancock Creek at 37 43.47N and 75 51.06W and follow the channel to # 37. Straight ahead you will see Onancock Wharf! Boaters welcome at warm and friendly Colonial Manor Inn Bed & Breakfast which is just a short stroll from Onancock Wharf. Give us a call and we will pick you up. Trips from Onancock to Tangier Island, Virginia - As a guest of Colonial Manor Inn, there is plenty of time for a great breakfast with time to spare if you are departing to Tangier Island for the day. The Joyce Marie II ("Tangier Ferry" as it is called by the locals) leaves Onancock twice a day. See Passenger Ferry Schedule This passenger ferry accommodates up to 25 people. Reservations suggested. Tickets can be purchased at the boat.